Is the Kindle Hurting Amazon’s Profits? Tuesday night, Amazon told the world what they’d earned over the summer — and the news sent a shock to their investors on Wall Street. 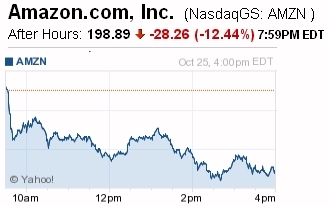 At one point overnight, Amazon’s stock lost 19% of its value, according to Bloomberg News. 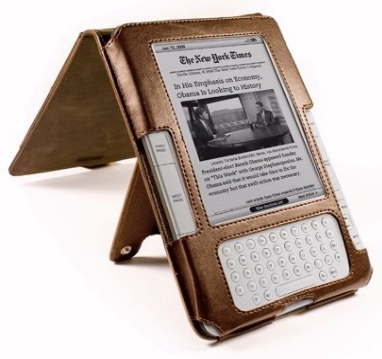 And analysts seem to be placing part of the blame on the Kindle. “We’re not seeing the investment pay off yet,” an analyst at Evercore Partners told Reuters, adding “I think investors are impatient as to how long will it take…” Though he didn’t directly mention the Kindle, it’s clearly been one of Amazon’s biggest investments in 2011 — and another executive at a sales software company specifically pointed to its impact on Amazon’s profit margins. “The revenue is a little light, but margin is where the biggest variance is from Wall Street’s expectations,” Scot Wingo explained to Reuters on Tuesday. In fact, Amazon’s net sales increased a whopping 44% from where they were a year ago, to $10.88 billion dollars for just the three months between July and September! And Amazon has a long history of seeking more customers rather than more profits in order to expand the company. I remember the day in 1999 at a dotcom where I worked, when a co-worker scoffed that Amazon had never — ever — actually reported a profit. Two months later, our own dotcom failed. (In fact, the man who’d told me that went to work for another dotcom — which then also failed within five months.) But exactly two years later, Amazon reported their first profit in 2001. And of course, Amazon.com is still there a decade later — and it’s now the world’s largest online retailer. So instead of adopting a short-term focus, I look at how Amazon’s positioning themselves for the future – and today, Amazon dropped some interesting clues. CEO Jeff Bezos revealed that the day they announced the new Kindles in September “was the biggest order day ever for Kindle. Even bigger than previous holiday peak days!” Plus, they’re selling more of them than they did past versions of the Kindle. “In the three weeks since launch, orders for electronic ink Kindles are double the previous launch,” Bezos said in a statement. I wondered if that’s why Amazon scheduled their press conference for the last days of September — so they could count those pre-orders as part of Amazon’s profits for the summer quarter. (And it gives Amazon a way to show investors they were offseting all the costs of building them!) But Bezos’s statement also seems to imply that Amazon’s now expecting to sell at least two million more Kindles than they’ve already sold. It’s a guess that’s echoed by an analyst at Barclays Plc, who’s predicting that Amazon will sell 4.5 million in just the last three months of 2011. That’ll add up to nearly a billion dollars in Kindle sales for just 92 days! Tuesday’s drop in Amazon’s stock price meant that at one point poor Jeff Bezos had seen his portfolio drop $4.67 billion within just a few hours, according to Bloomberg. And buried in their article was another small piece of bad news. Over the summer Amazon also lost more than half a billion dollars in shipping costs, spending $918 million in shipping expenses while taking in just $360 million to cover it. Bloomberg attributes that partly to Amazon’s “Prime” shipping service, which grants unlimited two-day shipping for a flat once-a-year fee of just $79. Fortunately, Amazon’s added new warehouses in over a dozen states to keep shipping costs lower — but of course, that’s also cost them some extra money just to get them set up! It’s fun to go back and look at what Bezos was telling investors before Amazon revealed their Kindle Fire tablet. At a time when it seemed like Amazon was simply spending money on research, Bezos told the audience that “We are planting more seeds right now.” Historically Amazon has endured some scorn for their strategy of growing their customer base rather than grabbing easy profits. But Amazon’s response has always been that once people became regular Amazon customers, they also generate regular profits for Amazon — month after month. I think Amazon’s making some of the right moves — which may be absolutely necessary if they’re going to survive in a digital age which has already sent Borders’ printed-book stores into bankruptcy. After all, Amazon built their business selling printed books, and they’re trying to ensure that they don’t get left behind when a new book-reading technology comes along. In just the month of July, seventeen publishers reported a total of $82.6 million in ebook sales, according to Publisher’s Weekly, which also noted that this sales figure was 105.3% higher than in July of 2010. In fact, that was the smallest year-to-year increase seen so far in 2011, and for the year, total ebook sales increased by 152.8% — to $560.5 million. Amazon’s trying to position their book-selling business so sales can continue long into the 21st century. This means if you wanted to bet on Amazon’s future prospects, Tuesday’s stock market turmoil was actually good news. Because if you’ve ever wanted to buy Amazon’s stock — now it’s a lot cheaper!